Every Charles Tyrwhitt shirt is made from the softest, most luxurious cotton, but it’s the way in which the cotton fabric is woven that gives each shirt its unique quality. The weave affects not only the way a shirt looks and feels, but also how warm the fabric will be, the way it drapes, how easy it is to iron, and, occasionally, where and when it should be worn. We use a variety of weaves across the Tyrwhitt shirt ranges. Here are some of our favorites. 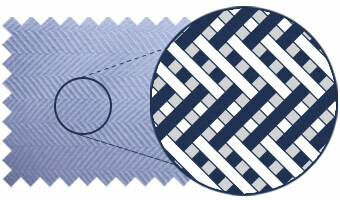 Poplin is a strong cotton weave with closely woven threads in a simple criss cross pattern. This is a lightweight, cool weave with a smooth and silky finish. Poplin fabrics are very breathable, so a poplin shirt is ideal worn under a suit or on a warm day. Herringbone is a diagonal weave with a pattern resembling a reversing zigzag or a fish skeleton (which is where the name “herringbone” comes from). This weave is more water resistant than plain weaves, so herringbone fabrics dry quickly and are easy to iron. 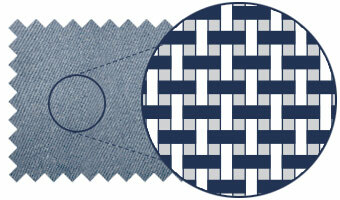 Herringbone has a smooth feel, textured warmth, a soft drape and occasionally a slight sheen. Twill is made by weaving twin horizontal threads under and over vertical threads to create a distinctive diagonal pattern. Twill fabric is soft and thick, resistant to creases and easy to iron. It also drapes very well, producing a smart result. 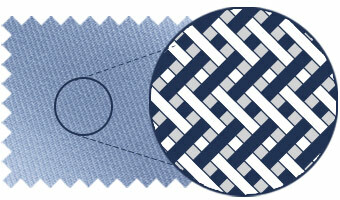 Oxford is a type of basket weave with interlinking warp and weft threads. 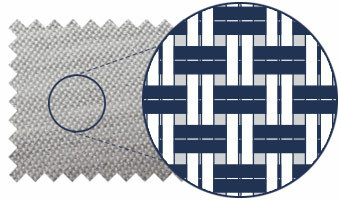 Often the threads running in one direction are coloured, while the threads in the opposite direction are white, resulting in a two-tone textured appearance. The Oxford weave is popular in casual shirts, particularly with a button-down collar, although Oxford shirts can certainly be worn to the office if the cut and finish are professional enough. Oxford fabrics are thick and warm, perfect to wear on cool days.